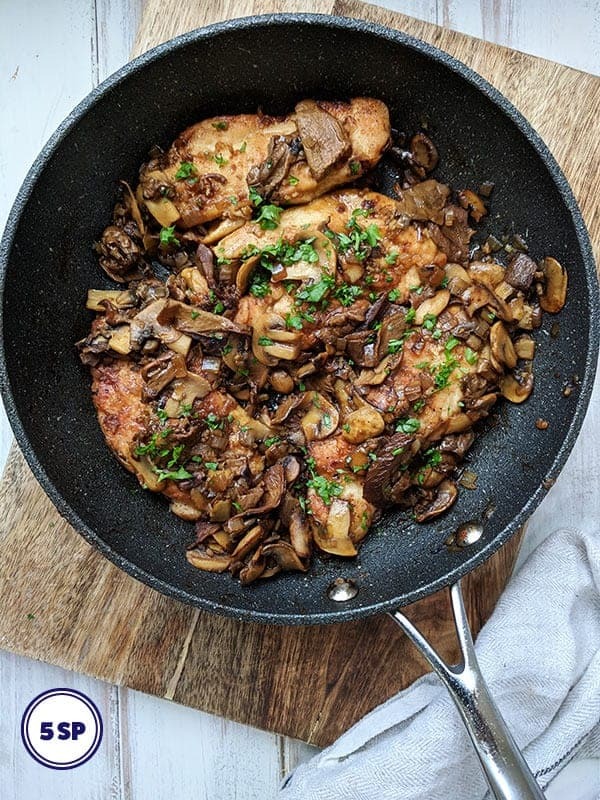 Traditional Chicken Marsala recipes are often high in fat and therefore high in Smart Points. This recipe has been adapted to make a Weight Watchers friendly version that doesn’t disappoint in taste. Chicken Marsala, an Italian-American dish, is made with sauteed chicken cutlets cooked in a mushroom and Marsala sauce. This particular recipe is rich and tasty and is just 5 Smart Points per serving on Weight Watchers Freestyle / Flex plan. Often recipes that have been adapted to be Weight Watcher friendly can lack in taste and flavour. This one doesn’t lack flavour in the slightest. It packs a punch! Porcini mushrooms add a strong nutty flavour to the dish and the Marsala, a dry Sicilian wine, adds a real depth to the dish. The dish is also really versatile as it can be served with noodles (or zoodles if you want to keep those Smart Points down) or with vegetables such as mashed potatoes or crushed new potatoes. 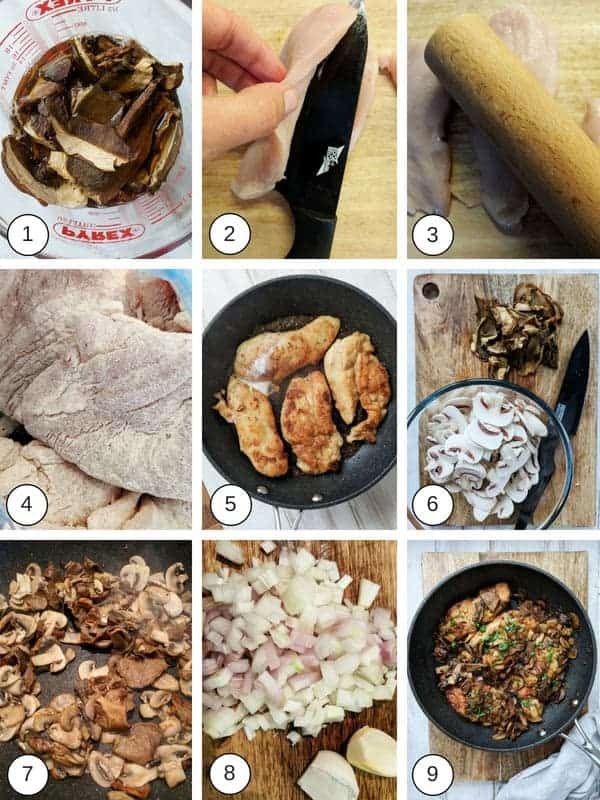 Use good quality Porcini mushrooms for this recipe. Place them in a jug and pour in boiled water so that the mushrooms are just covered (see pic 1). They will need to soak for 15 minutes prior to using (or as directed on the packet). You will use some of this mushroom water to make the sauce, so make sure that you don’t throw it away. If you are using large chicken breasts you will need to slice them horizontally to make them thinner (see pic 2). The chicken pieces then need pounding till they are about 5 mm thickness (see pic 3). Chop the button mushrooms (pic 6) shallots and garlic (pic 8) prior to cooking the chicken as this will help with the flow of this recipe. When you add the mushrooms to the pan (pic 7) you want to to stir them continuously, scraping off any browned bits of flour and chicken from the bottom (leaving them in the pan from when the chicken was cooked adds to the overall flavour of the dish, but it is important at this point to prevent them burning to the bottom of the pan). Serve with a sprinkling of chopped parsley (pic 9) on pasta or zoodles or with vegetables. I used dried Porcini mushrooms, like these ones available from Amazon. They are also available to buy from major grocery stores and delicatessens. I used a quality frying pan, like this one which is available from Amazon. 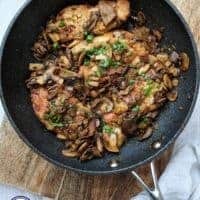 This rich and tasty Chicken Marsala can be served a number of ways. 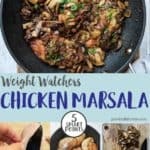 This low fat, low Point Chicken Marsala is just 5 SmartPoints on Weight Watchers Freestyle / Flex plan. Place the Porcini mushrooms in a jug and cover with hot water (see pic 1). Set aside and leave for 15 minutes before using. Chop up the button mushrooms and the shallots and garlic and set aside. Slice horizontally through the chicken breast (see pic 2). You do not need to do this if the chicken breasts are small. Using a rolling pin or tenderiser, pound the chicken breasts until they are approx 1/2 cm thickness (see pic 3). NB - if you use a wooden rolling pin to pound the chicken it is very important to clean it thoroughly afterwards. Heat the oil and half of the butter in a frying pan / skillet over a medium high heat. Place the chicken breasts in the pan and fry, turning once, until the chicken is golden and is just about cooked through. This will probably take 6 - 7 minutes. Turn off the heat, remove the chicken from the pan, place on a plate and set aside. Remove the Porcini mushrooms from the water and roughly chop up. Keep the water that the mushrooms have soaked in as you will use some of this for the sauce. Melt the remainder of the butter in the frying pan / skillet and add the chopped Porcini mushrooms and button mushrooms and stirring continuously cook for 4 - 5 minutes until they start to brown (see pic 7). Use a wooden spoon to scrape any browned bits from the bottom of the pan (these will add to the taste of the sauce). Add the chopped shallots and garlic and cook for an additional 2 - 3 minutes continuing to stir so that things don't stick. Now you want to add the chicken stock, 80 ml of the water that the Porcini mushrooms were soaking in, a little salt and pepper and the Marsala. Bring the sauce to the boil and then reduce the heat so that the mixture is simmering. Cook for 10 minutes until the liquid has reduced by about half. Add the chicken breast to the mushroom sauce and cook over a low heat until the chicken has cooked through (this should only take another 5 - 8 minutes).